We have been focusing to ensure that our attendance is as diverse as possible, in all ways possible. We’re so committed to this, we’re seeking partnerships to focus solely on diversity of the audience and speakers. We strive to be a conference where folks from all backgrounds meet to continue making technology great and accessible to everyone. Details of each of those commitments will be published here as they are finalized. Will this be your first php[world] or even your first tech conference? Don’t worry, we’ve got you covered to make sure that you have the best experience we can possibly provide. We have a specific session on the schedule that’s designed just for folks like yourself to show up and we’ll answer any questions you have and give you some advice on how to get the most out of your experience! We’ll also introduce you to a crew of experienced conference attendees, who are going to be volunteering their time to make sure to help newer attendees like yourself. They’ll be happy to chat with you, suggest talks that will match you best with what you want to learn, and just help guide you on your conference experience! Thanks to the support of our amazing sponsor Twilio, we are offering up (at least) 10 free tickets to people from underrepresented groups at conferences. We’ve partnered with diversitytickets.org to handle distributing these tickets is a fair and impartial manner. You’ll need to submit a short application through their system by September 30th in order to be considered for these tickets. They include a full ticket to the conference (though they can be swapped for a training class ticket instead if desired). We always work to provide a quiet room for people to use for whatever purpose that they need. Need to do a bit of work? Are you a speaker who wants to look over your slides? Do you just need a quiet place to sit for a while and relax while getting away from the crowds. Regardless of the reason, we always make sure a room is available for that purpose. All attendees will receive an email after buying their ticket asking if they have any food requirements. We work with our venue to ensure we can provide adequate nutrition options for every guest based upon any allergies (Gluten, Nuts, Shellfish), or other requirements (Vegan, Kosher, etc.). Through our sponsorship with Twilio, they are organizing a relaxed breakfast on Thursday morning at 7:30am in the hotel restaurant for attendees who identify with an under-represented group to get together, relax, and have breakfast together. Just head into the back of the restaurant and you’ll find the group that morning! The venue that we’ve chosen is very accessible, and all the conference takes place on the ground floor. We have also ensured that gender neutral bathrooms are available at the venue as well. 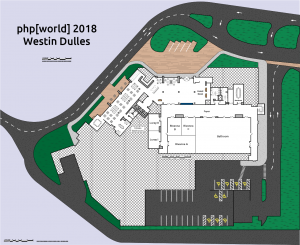 Below is a link to a highly detailed and dimensionally accurate map of the bottom floor of the venue, including all roads, paths, and parking. Dimensional marks should allow you to calculate any distances that you need. We’ve included a few details below that may be common questions. If you have any additional questions about the accessibility of the venue, please don’t hesitate to reach out to us.